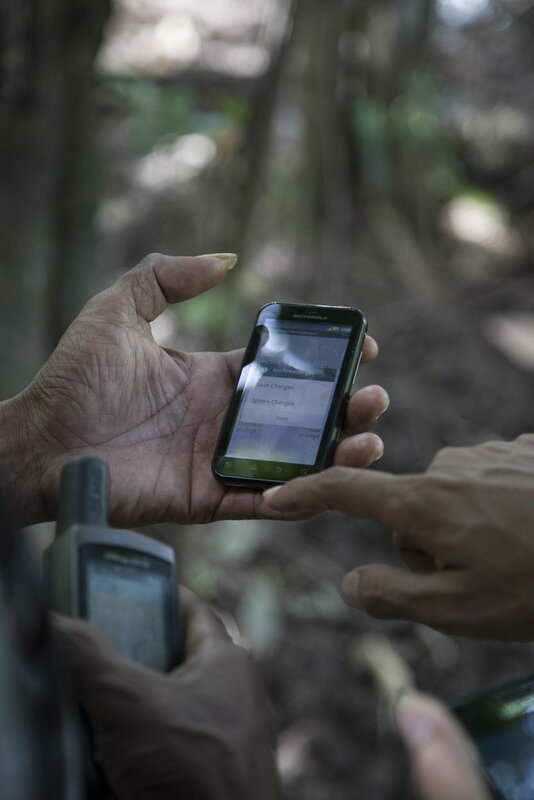 Over the past two years, EIA has been working closely with a network of activists to set up an innovative system for forest monitoring in Aceh. The province, on the very western tip of Indonesia, hosts some of the richest rainforests in South-East Asia. The peerless Leuser Ecosystem, an expanse of forest that stretches from coastal peat swamps and across Aceh’s mountainous interior, is home to Sumatran tigers, elephants, orangutans and rhinos. The conservation status of all four of these iconic species? Critically endangered. Most of the island of Sumatra has been denuded of forest cover by logging, forest fires and rampant plantation expansion. Between 2009-13 alone it lost more than one million hectares of forest – an area half the size of Wales. So if you look at a map of forest cover in Aceh, you can start to see how important it is for the survival of these beautiful mammal species. Put simply, if the forests of Aceh are lost, we may as well say goodbye to them too. But there’s more to forests than biodiversity. In fact, they’re at the heart of many of the most important challenges that face the global community; challenges such as climate change, maintaining clean water supplies, pro-poor development and food security. This is writ large in Aceh, where the fate of 4.7 million people is intrinsically bound to the fate of the forest. It’s not just about the people who live in and are directly dependent on the forest, of which there are many. It’s also about communities whose homes will be washed away by natural disasters if the vital role forests play in regulating water systems is undermined. Or what will happen to the farms on which the entire population relies, if deforestation leads to flooding and droughts. The challenges facing Aceh are manifold, with companies willing and able to illegally destroy carbon-rich peatlands and a provincial government attempting to illegally undermine the protected status of vast areas of forest. But standing in Aceh’s favour is a close-knit network of community activists who are fighting tooth and nail for the future of their province. This is, after all, the only place in Indonesia where NGOs have been successful in forcing the Government to cut down illegal palm oil. Under the umbrella of Koalisi Peduli Hutan Aceh (the Aceh Coalition for Forest Care, or KPHA), these activists are leading the legal battle to prevent the Government from opening up the forest for logging and conversion. Since 2012, EIA has been supporting KPHA to build a platform that allows it to crowdsource data on the threats to the forest. More than 100 members of the network are now trained and equipped to send geo-tagged information from the ground to a website, where it can be viewed in the context of other data such as spatial plans, species habitats, and concession maps. Today (March 11), Effendi Isma, the spokesman of KPHA, will speak at an event in Jakarta on the use of smartphones in forest monitoring. The event is one of a series put on under the umbrella of If Not Us Then Who, by Handcrafted Films and the Indonesian indigenous peoples’ network AMAN. The event showcases EIA’s film on our Aceh project, along with others demonstrating the leading role indigenous people can – and do – play in stemming deforestation and man-made climate change. Watch the film to find out more about our project, and visit www.hutan-aceh.com to view images from the ground.